TOP LEFT: Bahamian and Island MMTS brainchild, Pia T. Glover-Rolle being interviewed ---- TOP RIGHT: Prime Minister of The Bahamas, the Rt Hon. 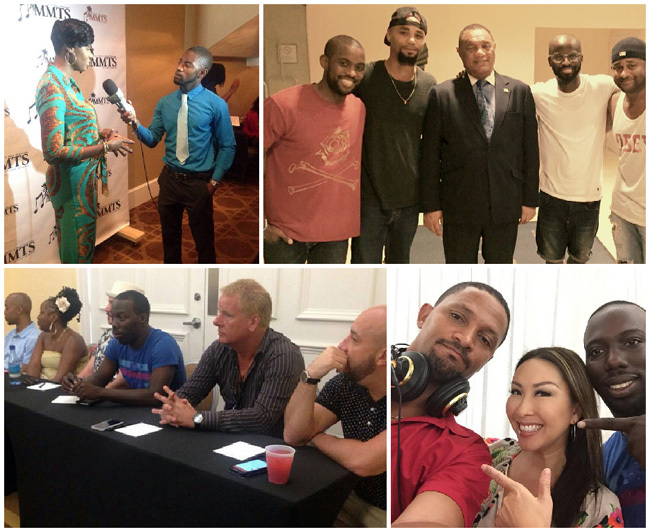 Perry Christie with MMTS Panelists --- BOTTOM LEFT: MMTS Panelists ___ BOTTOM RIGHT: Hot 91.7 was live on location at Melia for #IslandMMTS! Above is King C Note, Lilly Jang and Jay Isaacs! Nassau, New Providence - Top international fashion and talent scouts, casting directors, record labels, music producers and industry executives will journey to The Bahamas July 13-19, 2015 for the first annual Music, Model & Talent Showcase of the Islands (Island MMTS) which will be held at the Melia Nassau Beach Hotel on the new Bahamian Riviera at BahaMar. Island MMTS is a one-of-a-kind event for the islands, and is the only entertainment, modeling and acting showcase in the world specifically targeting the Caribbean market. Talent from 37 islands and 23 countries, ages 5 to 65 will be represented and showcasing to influencers from U.S., Canada, Latin America and Europe whose business is to identify and develop future stars. Island MMTS is poised to bring approximately 1,500 stopover visitors to the Bahamas July 13 to July 19, 2015. Island MMTS is the brainchild of Pia T. Glover-Rolle at the helm of top Bahamian firm PTG Marketing and Modeling Agency, which has a proven track record of success in modeling, talent development and placement in the industry, both locally and internationally. “Love the idea of cultivating the region's talent for local and mainstream opportunities.” – Kim Fields, Actress & Film Director, Panelist & Seminar host at Island MMTS. Over 150 Caribbean based aspiring and (semi-)professional models, actors, singers, songwriters and music producers are slated to attend the Island MMTS 2015 International Conference. At Island MMTS they will network, attend workshops to get educated about the entertainment industry, and have the opportunity to get scouted by some of the biggest entertainment industry representatives globally. Island MMTS offers the exclusive opportunity for talent to get agents’ undivided attention with the chance of obtaining contracts, exposure and representation opportunities. There is great anticipation that the next big “star” will be discovered at Island MMTS 2015. The ratio of delegates to agents at the annual conference will be 10:1, which is essential for networking and exposure. Talent from 5 years old to 65 years old, male and female can attend free auditions held throughout the 37 participating islands. To date confirmed Caribbean and Bahamian Islands on board include: Anguilla, Antigua, Aruba, Barbados, Belize, Bermuda, Bonaire, Cayman Islands, Cuba, Curacao, Dominica, Dominican Republic, Grenada, Guyana, Haiti, Jamaica, Martinique, Montserrat, St. Croix, St. John, St. Kitts & Nevis, St. Lucia, St. Maarten, St. Thomas, St. Vincent & the Grenadines, Suriname, Tortola, Trinidad and Tobago, Turks & Caicos, Grand Bahama, San Salvador, Cat Island, Bimini, Eleuthera, The Abacos, The Exumas and New Providence. Island MMTS welcomes the following agents, scouts and international media July 13 - 19 to our inaugural conference as we "Take Caribbean Talent to The World".